This year, since Pascha is relatively early, the 8th of April, there was a very short period of time between the festal period of Holy Nativity and Holy Theophany and the beginning of Great Lent. She just finished singing the festal hymns of the feast days, and then we commenced to sing the preparatory hymns of the time of repentance. On Forgiveness Sunday, the Vespers for Clean Monday, when the tone of the services markedly changes from the solemnity of the Sunday service to the Lenten chants as symbolized by the change in liturgical colors from gold to black (this year, from blue to black, since we were still in the afterfeast of the Meeting of the Lord), the residents of Holy Trinity Monastery, both monastics and seminarians, began to spiritually prepare themselves for the podvig of the first week, when the monastery goes into sort of a lockdown. At the evening meal, all that is prohibited to partake of until Pascha, is brought out to consume. 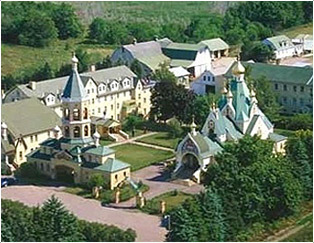 At 8PM, the Small Compline service was started, culminating in the Forgiveness Service, when all the residents of the monastery, from the abbot to the youngest seminarian, along with the pilgrims, ask forgiveness one of another, as the spiritual way of preparing to enter the time of repentance. The abbot, Archimandrite Luke, explained in a brief sermon the need to ask forgiveness as the necessary background for seeking God’s forgiveness. All week along following, the services began as usual at 5:00 AM, with the exception of Monday, when they began at 5:30 AM. Basically, we were in church all morning, either singing or reading the lengthy Lenten services and listening to the appointed readings of Fr. Luke from the Holy Fathers. After Vespers, a very simple lunch would be served, of pickled vegetables, bread, tea, fruit and not much else. On Wednesday the first Presanctified Liturgy of Lent was served with its wonderful solemnity. Friday this liturgy was also served, after which specially prepared Koliva, boiled wheat, was served in honor of the Great Martyr Theodore the Tyro. Every evening, the specially loved Great Canon of St. Andrew was served with the attendance of many neighbors and pilgrims. On Friday evening there was confession, and the Rule for Communion was read during the Compline service. On Saturday, everyone with few exceptions were blessed to receive the Holy Mysteries. 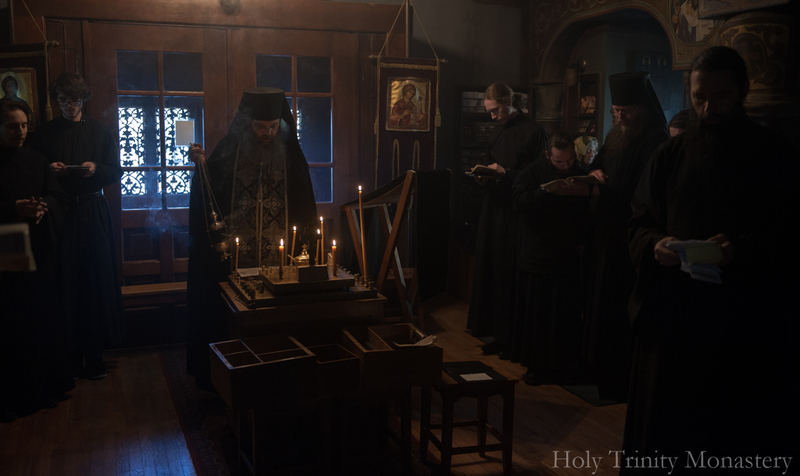 Our general preparation for Holy Communion was followed by the solemnity of Orthodoxy, when the Holy Church commemorates the triumph of true Orthodoxy over the heresy of iconoclasm, in particular, and against all heresies, in general. As has been the tradition of the Church Abroad, the service of Orthodoxy with the anathemas against all heresies was held, in which the Holy Church also commemorates all the champions of Holy Orthodoxy. We were blessed once again to have the participation of His Grace, Bishop Jermoe, to headed up the weekend services.